From baby bottle covers and bibs to hanger covers and hats, you are certain to find just the right project for the little newcomer in your life. Quick and easy, any one of these projects will make a perfect gift. Projects crocheted using medium weight yarn are Kitten Baby Hat, Baby Bottle Cozy, Baby Leg Warmers, Hanger Covers, Baby Mitts, Booties, and Bath Mitten; Baby Bib is made using light weight yarn. 32 pages. Keep your baby warm and feeling secure with these five adorable cocoon sets from Annie's Attic! Includes four cocoons with matching hats, plus a one-piece hooded cocoon. Made using sport, worsted or bulky weight yarns, each set is perfect for a newborn to 3 months. Sweet sets to knit and crochet for baby girls and baby boys. 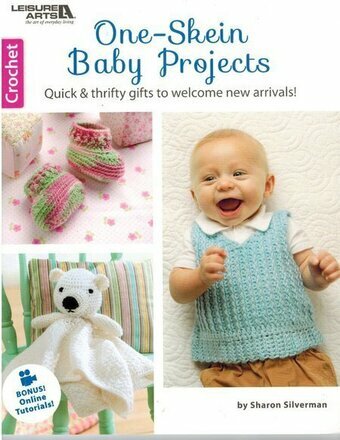 Patterns include "Sporty Set to Crochet", "Lacy Set to Crochet", "Pram Set to Knit", and "Overalls to Knit". All designs made using Bernat Softee Baby, sizes 6 to 12 months. All patterns Intermediate. Want a gift idea that will be a big hit at baby showers? 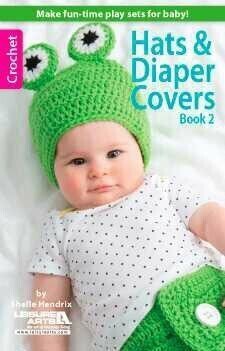 Crochet these adorable hats and diaper covers by Shelle Hendrix. They will transform Baby into a playful frog, panda, sock monkey, lamb, mouse, or teddy bear. Designed for Beginner-Plus skill level, each set fits sizes 3 to 6 months. Five are crocheted using medium weight yarn, and the cuddly lamb outfit is made of super bulky yarn. 48 pages. 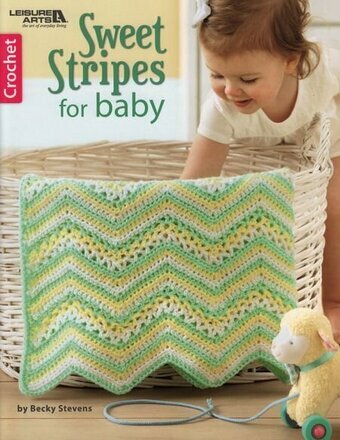 When you need a quick gift for a shower, choose a mile-a-minute baby afghan! Mile-a-minute designs all have an easy, repetitive pattern that you can finish fast. The tutorial and sample project in this book explain how it works, and the six afghans show some of the many styles that are possible. What they all have in common is that they are crocheted in narrow panels, either in short rows or around a long beginning chain; then a border is added and the strips are joined. Crocheted using light or medium weight yarns, designs include Lemon Drop, Pineapple Parade, and Wavy Strips, all by Anne Halliday; Miles of Shells by Carole Prior; Easter Mile-A-Minute by Jennine Korejko; and Daisies for Baby by Terry Kimbrough.